Strain localization in the form of a deformation band is the most extensively investigated instability mode in geomaterials. Deformation is localized to a narrow band that could shear as well as either dilate or compact. The jump in the strain rate across the band is given by a tensor of determinant rank one. However, loose soils can also implode when subjected to compressive stresses. In this case the mechanism of deformation is diffuse in the sense that the jump in the strain rate tensor has a full rank. Only very recently has this mode been studied extensively in the context of material instability (Borja 2006a). 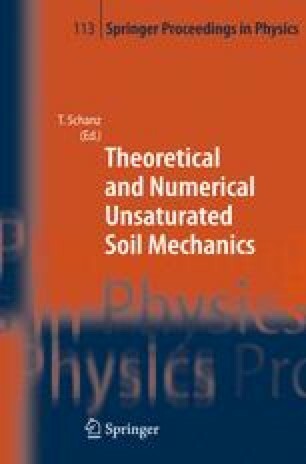 In this paper we move one step further and consider the effect of volume constraint associated with the presence of fluids, specifically water and air, on loose soils that have a tendency to implode. The upshot is that, depending on the degree of saturation of these soils, the fluids may inhibit the solid from imploding freely resulting in a rise in the pore fluid pressures. The eigenmode at bifurcation is represented by the composite jumps in the strain rate tensor and the rates of pore air and pore water pressures. The framework of stability analysis presented in this work can be used to develop a criterion for the onset of liquefaction instability in fully saturated soils.